Eric Morley on why timbers split and crack, how long it takes timber to dry, where to get dry timbers, and why gunshots in the night are nothing to be afraid of . . . Splits and cracks (known as ‘checks’ in the industry) occur when wood shrinks as it dries. 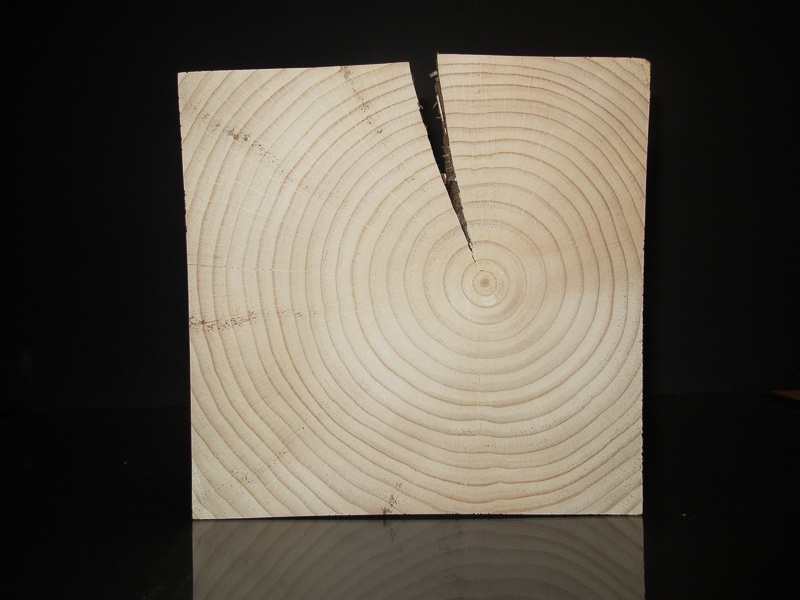 Wood shrinks roughly twice as much along the growth rings (radially) as it does across the rings (tangentially)–and it is this uneven shrinkage that causes checks to develop. Here at Carolina Timberworks, we think of them like wrinkles in a cotton shirt—it proves the timber is real. Checks are what make a solid timber look different from a boxed beam. Look at the reclaimed timber below. It is impossible to predict where a check will appear in a timber, and it is the check that gives this reclaimed Oak timber so much of its character–and a big part of what makes it completely unique and different from any other beam in the world. Ever heard the song of the wood? Have you ever taken a hot loaf of artisan bread out of the oven, and put your ear to it? If you do, you’ll hear the song of the bread–pops and crackles as the crust shrinks, cracks and dries. Walk into a timber framer’s shop one winter evening when everyone has gone home for the day. Throw another log into the wood stove, and listen carefully. If there are green (wet) timbers arrayed on sawhorses, within a few minutes, you’re likely to hear the song of the wood–a symphony of pops and cracks as new checks develop. And if one night, asleep in your new timber frame home, you’re awoken by a loud crack a little like a gunshot–don’t worry. Roll over and go back to sleep–it’s just your timbers singing to you. It sometimes surprises people to learn that roughly half of a living tree’s weight is water. Let’s consider a 24’ long Douglas Fir log that measures 34” diameter at the large end and 14” at the small end as an example. This hypothetical green (wet) log would contain a little over 1 ton of water—or about five 55 gallon drums of water. Sometimes when we drive a chisel into green (wet) timber, water spurts out of the wood. Wood is hydroscopic—meaning it’s like a sponge in that it can absorb, hold and release water. When freshly cut, approximately half of a tree’s weight is water. The photograph below shows water in a freshly cut Cypress timber–and how the timber is drying from the outside in. How long does it take a timber to dry? It’s not exactly a fast process, and it depends on the humidity of the environment in which the timber is located, but one rule of thumb is that a timber air dries about 1” per year. Thus a 12” x 12” timber would take about 6 years to dry to the center. How dry will the timber become? A timber will eventually air dry to the Equilibrium Moisture Content (EMC) of its environment. The EMC is the point at which wood is neither losing nor absorbing water. A timber’s moisture content is determined by the atmospheric humidity of the timber’s environment. That environment varies, of course. Is the timber located inside, or outside? What part of the country is it located in? What time of year is it? For example, in the dry mountain air of Denver, the outdoor EMC of wood exposed to outdoor atmosphere in July is 9.4%, while New Orleans is 15.3% (Forest Products Laboratory: Equilibrium Moisture Content of Wood in Outdoor Locations in the United States and Worldwide, August 1988). How wet (or dry) are my timbers? Since we can’t see the water in wood, moisture meter are used to measure moisture content. 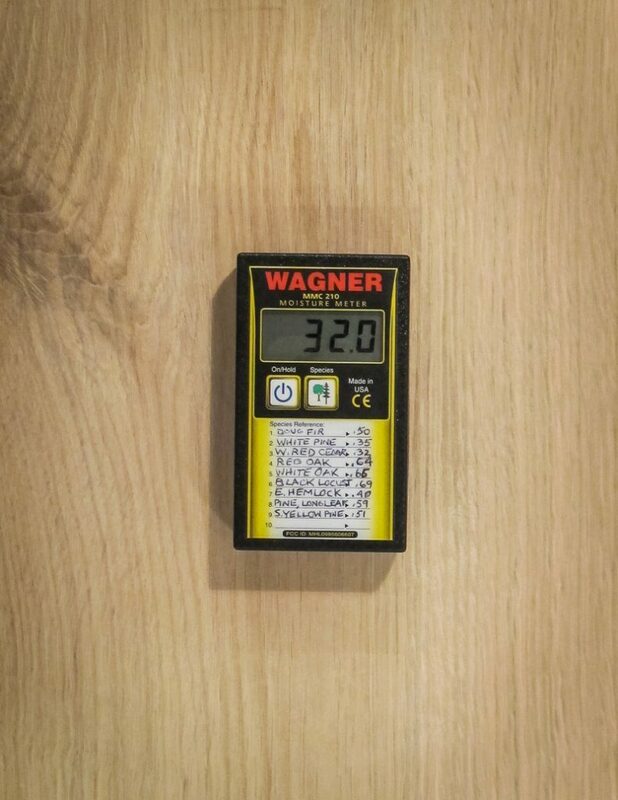 Inexpensive moisture meters measure the surface moisture content—which works ok for 3/4” boards, but not 8” thick timbers. Professional moisture meters use electromagnetic scanning to read the moisture in the wood, not on the surface of the beam. What is the average moisture content in the U.S.? The majority of the U.S. has an 8% average moisture content, the Southeast and California coastal areas have an 11% average moisture content, and the Southwest desert areas are closer to 6%. It is impractical (it takes years) to air dry timber, and we humans are an impatient species, so for the last two thousand years, people have been building timber frames from green (wet) timber. Yes, green timber will shrink, check, and sometimes twist as it dries, but timber framers and engineers understand and account for the movement. 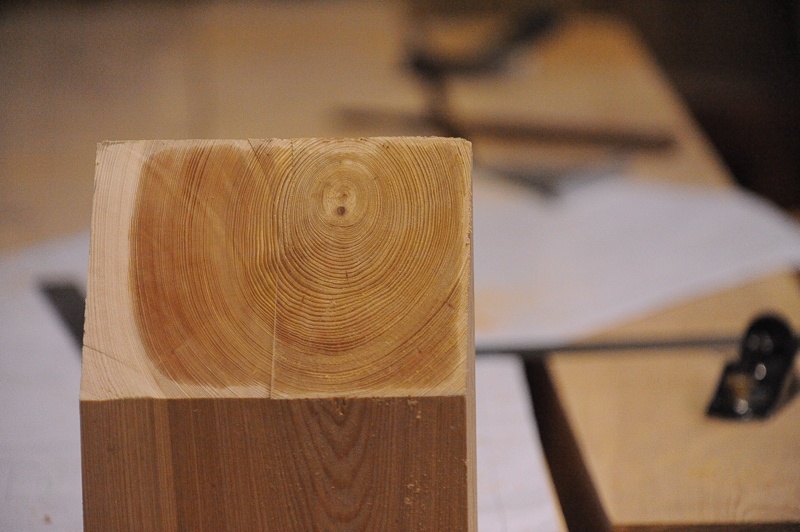 Checks begin on the exterior surface of a timber and almost always stop at the heart (center) of the timber, and are almost never a structural concern. 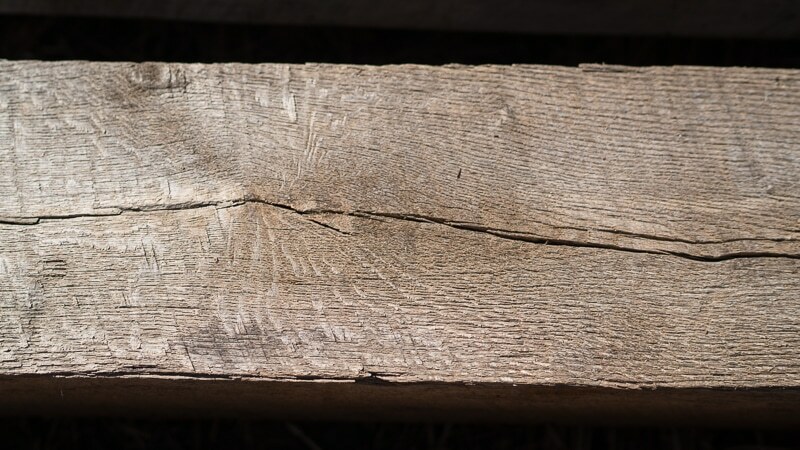 By the way, if a crack were to develop all the way through a timber (splitting it into two separate pieces), it would be called a split–and might be cause for concern. How much does green (wet) timber shrink as it dries? Shrinkage depends on the species, but more than you may think! 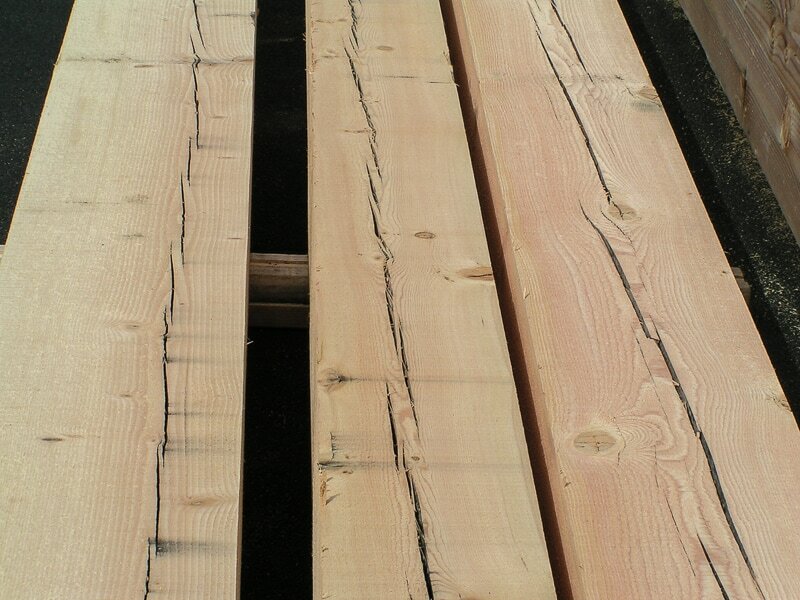 Since many timber frames are built from Douglas Fir, let’s start by looking at a 12×12 Douglas Fir (Coastal) timber. This particular green (wet) Douglas Fir timber, dried to a final moisture content of 8%, would be expected to shrink a little less than 9/16” on each face–from 12” x 12” to a final size of 11-7/16” x 11-7/16”. Western Red Cedar shrinks less: The same size timber in Western Red Cedar timber would shrink a bit less–about 5/16” to 11-11/16” x 11-11/16”. Finally, how about a species with a high shrinkage rate, like White Oak? It would be expected to shrink a bit less than 3/4” to slightly larger than 11-1/4” x 11-1/4”. Specify Free-Of-Heart-Center instead of the less expensive Boxed Heart grade. Utilize housed joinery wherever possible. The slower the drying, and the more gradual the process, the better—i.e. the worst thing you can do is to enclose the timber frame and immediately turn on the heat or air conditioning full blast. Do not apply a film-forming finish (i.e. polyurethane) to green wood. I don’t want cracks (checks) in my timbers. What are my options? Don’t build with solid timber. Instead, ask us to price glulam beams for the timber frame, or to fabricate box beams from well-dried new or reclaimed lumber. Or if you’re ok with some checks, but would prefer to avoid some of the characteristics of green lumber, consider purchasing your timber like you do your high-quality organic cotton t-shirts–pre-shrunk. There are two ways to buy dry beams: New timber that’s been dried in a kiln, or reclaimed wood that’s dried slowly and naturally for 50 or 100 years during its previous life as a barn or warehouse. Where to buy kiln dried timbers? We offer two types of kiln dried timber: Conventionally kiln dried (KD), and Radio Frequency Kiln Dried (RFKD). Conventional kiln drying dries about the outer 1” or so–leaving most of the timber wet. The other method, RFKD, is similar to a giant microwave and dries timber to the core. What you need to know about RFKD timber is that it currently works only on Douglas Fir, it is dry to the core, and it is more expensive. It is, however, not as dry as conventionally kiln dried hardwood flooring or lumber (6-8% moisture content). For example the driest grade of RFKD timber measures 15% or less moisture content 3” in from the surface of the timber. 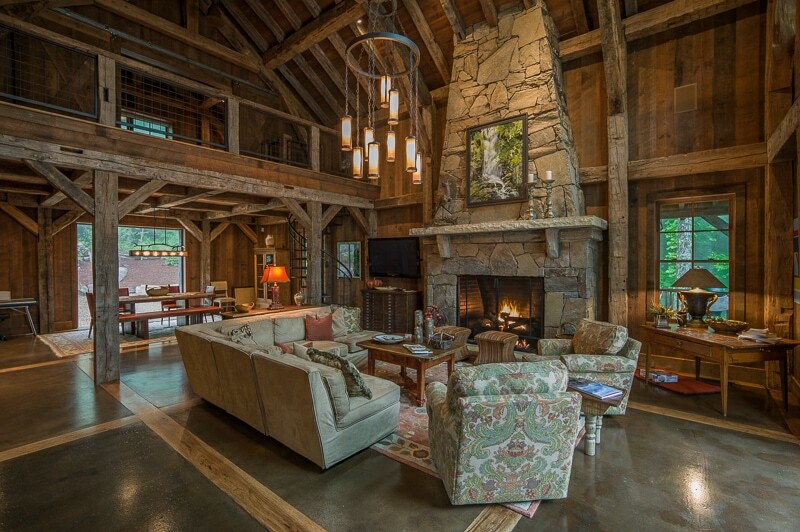 What about using reclaimed wood in timber frame construction? Reclaimed wood beams that have naturally air-dried for 50-100 years during their previous life as a barn, factory, or warehouse are often completely dry to the core–and the driest timbers available anywhere. It’s not easy to hand-scribe and connect irregular, twisted, and non-square reclaimed beams so the the finished timber frame appears to have always been one frame. We think a timber frame built from reclaimed wood is everything that today’s sleek, mass-produced, technology saturated culture isn’t. It celebrates the cracks and character and dirt and all the other marks that time, weather, and use leave behind.